Angle takes us to other times and places through the art of storytelling over soul-touching beats in collaboration with the finest underground talents. Wake up and talk away! 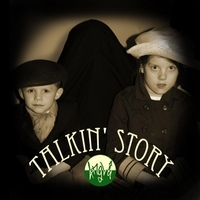 Talkin' Story is the follow-up album to the acclaimed Definitive Bedtime Stories (2015), but the project stands its ground as another cult favorite. Again, Angle is supported by his trusted inner circle of talent that has stamped uniqueness on the history of his impressive underground catalogue. Felix Thunder and Kurt Loving return on vocals. Angle and long-time respected peer, Ptate, finally collaborate on All Alone. Myka 9, Freestyle Fellowship member and early Angle influence, appears on the jazzy collaboration Hazy on a Clear Day. Some old and new friends provide the color to Angle's illustrations. Beats from the likes of Aeon Grey, The Dust Collectors, Samuel Jonathan Johnson Jr., Tremayne and Gato will impress passersby and invoke pride in long-time fans. Trusted musician, J8 rounds out the sounds with instrumentation to bolster the vinyl nuggets. While the story of Angle continues, the characters increasingly develop, build and grow. Like any great story, Talkin' Story will get better every time you hear it and it never gets old.